People want to know what I, a Jewish guy, think about Israel. I want to make something clear. I live in New York. I am from New York. I do not have a right and do not want a right to "return" to Israel. I never was there. I want to skip all the arguments about whether or not today's Jews descend from the people of the Old Testament. I don't care if I do or I don't. It doesn't matter nor should it. The territory that is known to many as Palestine had been peopled by Arabic speaking folks for centuries, mainly they were Muslims, many were Christians, and a few of them Jewish too. Most of those people were kicked out of their lands and homes in 1948 by people like David Ben Gurion and Ariel Sharon and more were expelled in 1967. 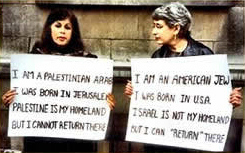 They are the ones who have a right to return, not me. Actually there is a place I want to return to. The New York of my youth. That was a place where the schools were the best. Where a first class education to the university level was there for free, with extra money for the most gifted. It was a place where a widow working as a sales clerk could pay the rent for an apartment for her kid and herself, not a room in someone else's place. The place I want to go back to was called a "Union Town." There were factories and warehouses and eleven or twelve newspapers that hired typesetters, proofreaders, truck drivers and more, people who could on their wages, pay a going rent. Yes, let the Palestinians return to their homes, and let me return to mine. Wow. I just hope that old fat guy has his "self-hating Jew" shield engaged.